The Excelsior may be due a revamp, but its flagship Chinese restaurant remains a vision of restrained elegance. 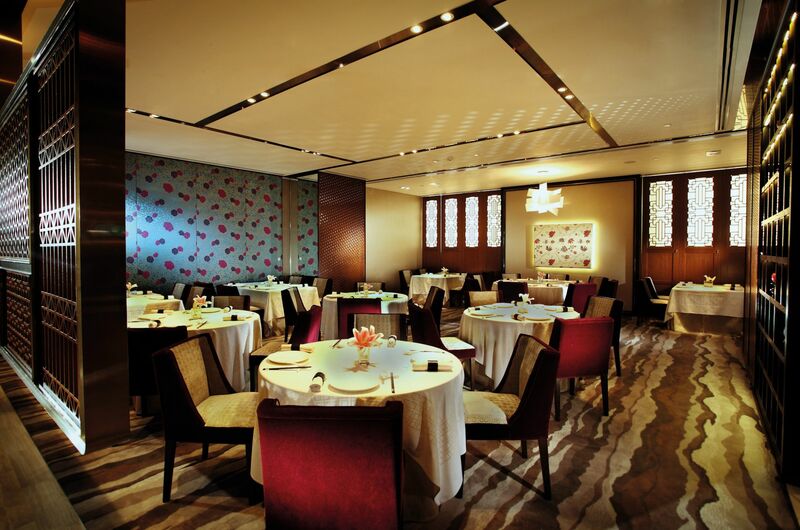 Popular with well-heeled Chinese families, the dining room is smart without being overly fancy, with dark ruby tones and bamboo lattice dividers giving stylish accents throughout the restaurant. An impressive floor to ceiling shelf highlights a number of elegant teaware, an indication of Yee Tung Heen’s dedication to the art of the brew. On Sunday evenings, the noise level can climb as the restaurant is a popular destination for large family gatherings, but those who wish for more privacy can request one of the five separate dining rooms. Far from being typical, Yee Tung Heen’s menu is a treasure trove of fanciful culinary techniques and intriguing ingredients, underscored by a reliable selection of Cantonese classics. The Twin Mushrooms Platter is an award-winning dish with original presentation: there are buns stuffed with fragrant fungi and fashioned to look like earthy Portobello mushroom caps, laying atop a grassy layer of crushed pistachio nuts. But do not be mistaken, as even the simplest plate of roasted chicken livers glazed in Chinese wine are impressive. With lightly charred edges and creamy centres, the livers are imbued with a beautiful aroma of rice wine and best paired with slivers of young pickled ginger. We also sample the steamed winter melon with crabmeat, carrot paste and egg white, which is a light and beautiful dish with plentiful crab. Back agai on the more humble dishes, sweet-and-sour pork has a wonderfully crisp coating that stayed crunchy throughout the meal, and we enjoyed the piquancy of the diamond-shaped slices of young ginger. We’re recommended the braised rice with crab and spring onion, and are pleasantly surprised: the rice is a pale jade colour as the spring onion is pureed and juice extracted to cook the grains, meaning every bite is fresh with the aroma of the allium. The barely-cooked pieces of scallop are a lovely addition, too. For dessert, Yee Tung Heen excels in traditional, nostalgic dishes such as their thin sesame rolls (made with both black and white sesame) and baked sago pudding with chestnut puree; the latter was skilfully done, not too sweet and with a wonderfully intense coconut aroma. The wine service here is on point, with the sommelier asking all the right questions when helping us to decide on a wine to pair with the meal. A Domains Schlumberger Riesling Les Princes Abbés had some interesting pandan and coconut notes that went well with our dishes. Generally we found the service top notch, as most staff were very familiar with the food and wine menus and professional in their manner. Our only quibble would be that we think the reservation desk should try to remind guests that some items require pre-ordering, as there are many award-winning dishes that tend to run out quite early in the evening. A meal for two with wine and service comes to around HK$1,300, which is fair value considering the quality of the ingredients and execution, in addition to the comfortable hotel setting.